Stuffing chicken breasts with your favorite ingredients is a fantastic and easy way to upgrade the weeknight dinner staple. From goat cheese to Moroccan couscous, here are nine awesome stuffed chicken breasts you should definitely be making. Pureed bacon, basil and garlic make a delicious filling. This excellent take on classic chicken cordon bleu replaces the heavy ham-and-Swiss-cheese filling with creamy havarti and thyme. Paris chef Tatiana Levha's delicious chicken breasts are worthy of a dinner party. Winemaker Robert Mondavi's mother often made this succulent stuffed chicken, which is a family speciality. This terrific North African–inspired recipe features couscous studded with apricots and pine nuts. Mixing a small amount of goat cheese with chopped walnuts and lemon zest makes a terrific, healthy filling. Five-spice powder and spicy Sichuan peppercorns amp up the flavor of these umami-packed chicken breasts. 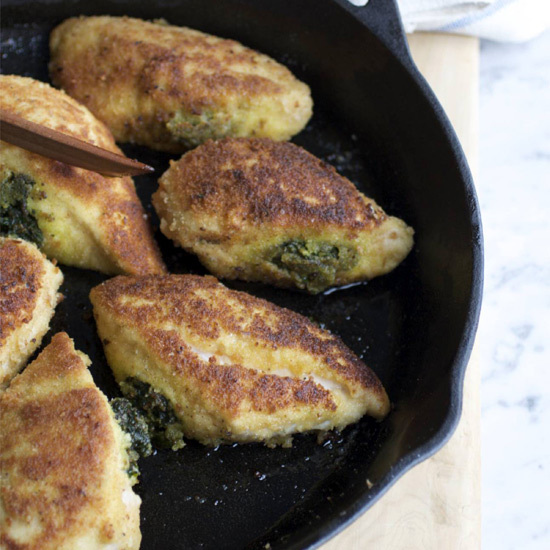 This quick chicken dish is ready in just 20 minutes. Don't have any Fontina cheese? Manchego or fresh Pecornino Romano cheese would also work well for this fast recipe.